Katie has been working for or with nonprofits for 25 years. Somehow, a short stint in membership turned into years of helping organizations get the most out of their CRM systems. A true Salesforce devotee, you can often hear her wax poetic about the “beauty” of a good flow or roll up summary. She loves making data come alive for users with clicks, not code. Katie has a BA in American Studies from Franklin and Marshall College with a minor in Secondary Education. 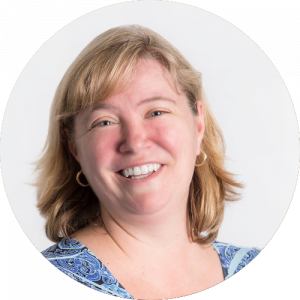 She is a Salesforce Certified Administrator, Advanced Administrator, Sales Cloud Consultant, Service Cloud Consultant, and Marketing Cloud Email Specialist. Katie lives in the DC suburbs with her husband, two kids, and a dog and a cat. In her spare time, you can find her running school PTO events or fundraising drives or working with Girl Scouts. Having completed a half marathon, she now just tries to keep up with her crazy running in-laws one 5k at a time.